The Salisbury Post was launched as the Salisbury Evening Post on 9 Jan. 1905 by J. B. Doub, E. C. Arey, and Gabe M. Royal from their Royal Printing Company in Salisbury, with John M. Julian as editor, Doub as business manager, and W. Thomas Bost as assistant editor. In May 1912 James Franklin Hurley, who had founded the Concord Daily Tribune in Concord, moved to Salisbury and in July 1912 acquired the controlling interest in the Post through a stock company composed of A. H. Boyden, M. L. Jackson, C. D. Rose, F. N. McCubbins, and Stahle Linn. The Post was the smallest newspaper in the state to publish seven days a week, starting in 1924, and the first to have its own engraving plant; it was also the first to use offset printing. In the early 2000s it remained one of the few papers in the state with a circulation exceeding the population of its hometown. It has consistently won state awards for excellence. By 1955 the Salisbury Post was owned entirely by the Hurley family. At his father's death, James Franklin Hurley Jr. took over operations. By the time of his own death in 1986, he had been either manager, publisher, or chairman of the board of the Post Publishing Company for 66 years. Hurley family members owned the paper until its sale in 1997 to the Evening Post Publishing Company, based in Charleston, S.C. The Salisbury Post's commitment to providing the best for Salisbury and Rowan County has motivated its endorsement of many progressive causes. These have included the purchase in 1928 (from a prize herd in California) of a purebred Guernsey bull, which was offered for stud to local farmers to upgrade their herds; the building of the Veterans' Administration Medical Center Hospital in Salisbury; and direct support for Livingstone and Catawba Colleges to ensure educational opportunities for the citizenry. Wineka, Mark. "3 generations of family led Post" Salisbury Post. May 29, 2005. Wineka, Mark. A Family Affair: The Life, Times and Sale of a Family-Owned Newspaper. Asheboro, N.C.: Down Home Press. 1999. "Catawba Trustee and Benefactor, James F. Hurley III, Dies." Catawba College. April 2, 2012. http://www.catawba.edu/news/archive/2012/04/02/jameshurley.aspx (accessed September 6, 2012). and Mass Communication. http://jomc.unc.edu/n-c-halls-of-fame/n-c-journalism-hall-of-fame#hurley (accessed September 6, 2012). JoannaSerah. "Salisbury Post building on the corner of Innes St. and Church St. in Salisbury, North Carolina, USA." April 11, 2012. Wikimedia Commons. 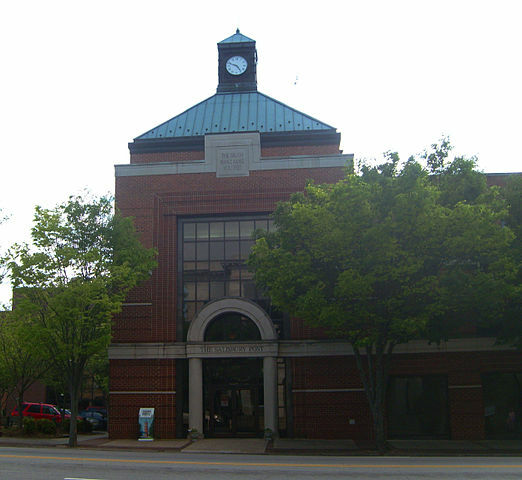 http://commons.wikimedia.org/wiki/File:SalisburyPost-SalisburyNC.jpg (accessed September 6, 2012).